The wild west of Antarctica has many thinning glaciers such as the huge Getz Ice Shelf, the Pine Island Glacier, and the Thwaites Glacier. NASA's Ice Bridge Project is now in full production there, showing how this strategic locked-up water is liable to be released quicker than we thought, causing higher sea levels worldwide. Read their blog for some interesting experiences of, "the untouched continent." Now, in a study by Columbia University's Lamont-Doherty Earth Observatory, using NASA surveys, the Thwaites Glacier has been confirmed as "anchored" by an undersea ridge. The 700 metre ridge held the glacier securely between 50 and 150 years ago, and still holds it with only one peak. The glacier is moving more and more quickly however, and scientists believe the ridge is losing its grip. Before NASA's DC-8 aerial survey of Thwaites, a robot sub was used in 2009 to investigate a ridge beneath Pine Island glacier. The belief is that warm ocean currents are rapidly melting this glacier, because it lifted off this smaller ridge in the 1970s and now moves 4x faster than Thwaites at 4km per year. Ice shelves, extending from land over the ocean, form the ends of many Antarctic glaciers, making them vulnerable to warm ocean currents. 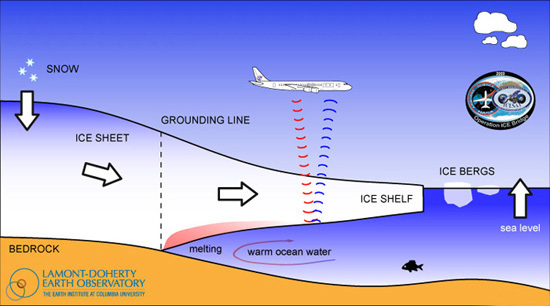 Radar signals from NASA's DC-8 can measure the depth of ice, but not of water. Since water generates less gravitational force than rock or sediment, it can be measured by combining gravity with other readings. The Nature Geoscience journal publishes the Thwaites Glacier research this week. The co-authors of the study, Robin E.Bell and Stan Jacobs, have regarded the Thwaites ridge like a person who holds back the crowd in a doorway. "Knowing the ridge is there lets us understand why the wide ice tongue that used to be in front of the glacier has broken up," Robin said. 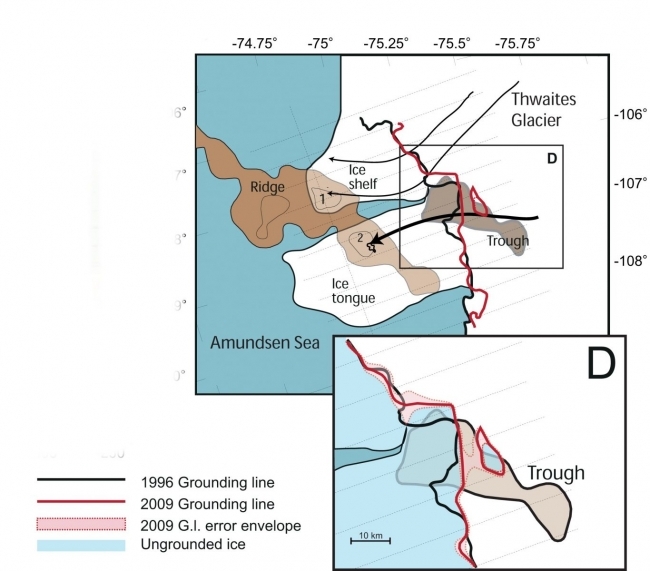 "We can now predict when the last bit of floating ice will lift off the ridge. We expect more ice will come streaming out of the Thwaites Glacier when this happens." That ridge is a critical part of the destabilisation, despite its previous role as protector. Antarctic ice is now one of the greatest threats to much of humanity (ie. those living in low-lying areas.) We need these projects and more scientists willing to use new technologies to investigate problems that are only now becoming ice-clear.